Disney’s latest princess tale brings in a world of change. Moana is Disney’s first Polynesian princess and more importantly she is about as real as they get in terms of appearances. Gone are the trademark tiny waists and big eyes. Also this daughter of the chief of Motunui is no damsel in distress. Featuring the vocal talents of Auli’i Caravalho as Moana and Dwayne “The Rock” Johnson as the demi-god Maui the story is about Moana’s quest to return the heart of island goddess Te Fiti which Maui stole and as a result of which death and darkness is spreading to Motunui. What follows is a series of adventures as Moana first seeks Maui, trying to convince him return the heart of Te Fiti, then them jointly looking for his magical fishhook that allows him to shapeshift and then them returning to Te Fiti only to be confronted by Maui’s nemesis Te Ka the Lava monster. Moana is bursting with Polynesian influences, the music and the dance, the myths and the legends all lend to a beautifully layered and mostly unconventional story telling as far as Disney clichés go. Maui played by The Rock is a tattoo clad haka-tribesman character. The Animation in Moana is amped up a notch beyond just the main characters. The tattoos on Maui also tell a story, they come alive, its animation within animation! It’s Anim-ception. Also the animation during the song “you’re welcome” where the 3-d animated Maui and Moana run through 2-d hand drawn animation you get a strange but pleasant surprise where visually the animated characters look real. Also in some of the scenes shot on the ocean it almost feels like the animated characters are superimposed on actual panoramic live photography of the sea. The vocal talents of Auli’i and Johnson are fun and never once do they get annoying. The characters of HeiHei the stupid rooster and Pua the teacup pig are cute. Moana is bursting with colour and happiness. Like in any typical Disney movie you never once doubt that the heroine will complete the task at hand but the somewhat predictable ride is made fun by stunning visuals that are full of colour and textures. Featuring the musical talents of Opetaia Foa’i, Mark Mancina and Lin Manuel Miranda – the superstar creator of the Broadway hit Hamilton, Moana has a very unique soundtrack that still has the familiar operatic notes of the Disney staple. I love animated films and the simple joys they offer. But Moana is extra special. It somehow feels a little grown up and the unbridled happiness and humour that it has to offer makes it one to be revisited many times. The only film I can compare this to visually was the stunning and colourful world of Nemo that Disney created nearly a decade ago. Go with kids if you have them or just go by yourself but don’t miss Moana. Pete Docter directs the vocal talents of Amy Poehler, Phyllis Smith, Bill Hader, Mindy Kaling and Lewis Black as Joy, Sadness, Fear, Disgust and Anger in Inside Out. The newest animated feature from Pixar takes us inside the mind of 12 year old Riley who moves from Minnesota to San Francisco. It is baffling how a studio like Disney can, on one hand create bland mess like the marvel multi-universe of superhero movies and then created animated features like Up, Wall-e and Ratatouille with so much heart and innovation. 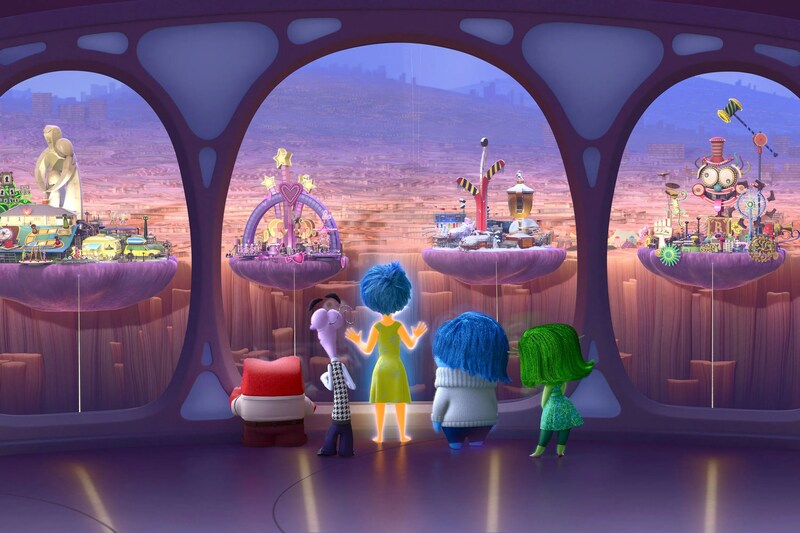 Inside Out sounds a bit outlandish and like an idea that will not translate as well on screen as it does on paper. Can you imagine the difficulty of writing the screenplay where you are constantly cutting back and forth between the actions of riley and the emotions at play inside her head? It could have easily ended up being a voice-over mess with every action and the intention behind it spelled out. But what story writing duo Pete Docter and Ronaldo Del Carmen and the Screenplay team of Meg Lefauve, Josh Cooley and Docter himself come up with is perfection. We are introduced to Joy as the first emotion when Riley is born and opens her eyes for the first time. And the how over the years other emotions start shaping up. Each moment in her life forms a memory which through jetson-like mechanics of suction tubes is transferred to long-term memory bank. There are major events in her life which form core memories. The core memories create personality islands which define who Riley is. The move from Minnesota to San Francisco throws things in the headquarters off for a spin and Joy who so far has been the primary emotion fuelling Riley is baffled at why Sadness is quickly becoming the dominant emotion. As Joy and Sadness try to work their way back from the long term memory bank we meet Bing Bong Riley’s imaginary friend, visit imagination-land, abstract thought generator, Dream land production, there is train of thoughts and also the memory dump where old memories go to fade and die. The world inside the head of a 12 year old is not the only place we visit, there is a sequence where we get a glimpse inside the heads of Mum and Dad and its hilarious. Anger is by far the most hilarious of the lot. Also towards the end we get an Inside Out view into the minds of a teenage boy, a dog, a cat, an emo/goth cool girl and the teacher. The beauty with which the story deals with the complexities of mixed emotions, growing up, how along with Riley the dominant emotion Joy also grows up and realises the importance of sadness and do I detect a sense of growing partnership called melancholy in the offering? With Puberty and teen-age kicking I am guessing Fear, Anger and Disgust will form a partnership as well. This is what I loved the most about the movie it makes you think of where the story will go once the credits roll. Not necessarily a sequel but just something to think about when you walk out the theatre with a grin on your face. Iron Man3 directed by Shane Black is supposed to setup the second phase of the avengers universe with Robert Downey Jr. donning the red and gold suit as the titular superhero and the PTSDed suffering Tony Stark. The movie is set in the immediate future after the happening of Avengers where the entire city was New York was laid waste after the aliens and other-world gods descended and the Avengers united. The movie sees Robert Downey Jr. spending an unhealthy amount of time staying awake as when he tries to sleep he fear the loss of “the one thing that he loves” Ms. Pepper Potts played by America’s most hated Ms. Gwyneth Paltrow . The main villain is played by Ben Kingsley who fashions himself after Osama bin Laden with video hijacks posting threatening messages to the president of USA and multiple bomb explosions around the world with no apparent traces for the explosives at use. The opening scene with the botanist Rebecca Hall might lend some clues as to what is at play but that is left for later to be unraveled. Ben Kingsley is wonderful in the most unexpected of ways. There are definitely some genuine moments of comedy which unfortunately were mostly lost on the audience I was with – I laughed out loud at the whole “ Hispanic Scott Baio” bit but other than that it is just mostly the dry witty charm of Robert Downy Jr. which carries this through . another funny moment was when Mandarin speaks of doing psychotropic drugs and ending up on streets doing unmentionable things it must’ve rung true for RDJ considering his past dealings. But again it was mostly lost on the audience I was in. There are some genuine high points in the movie especially involving Ben Kingsley’s Mandarin in the second half of the movie and Robert Downey Jr. is again in top comic form with an unparalleled comic timing. Guy Pearce brings a genuine menace to Adrian Killian and Rebecca Hall is beautiful and effective in the small but vital role that she plays. Guy Pearce as Adrian Killian is justifiably menacing but the motivations for his megalomaniac behavior are not as resolved. Don Cheadle is forever a character from Rwanda and I cannot take him seriously as the Iron Patriot or even consider the notion that from Iron Man 4 or onwards he would be donning the red and gold suit. I’ve enjoyed the individual Avengers movies more than the collective mess that Joss Whedon directed. And with this I enjoyed it as an inoffensive popcorn entertainment with a few genuine laughs. But overall the marvel universe lacks the gravitas that a DC-verse does and the Disney-marvel studio seems keener on getting more movies out there so that they can make a quick buck rather than alter the landscape of cinema in any real sense. A case in point would be the much touted last snippet which you have to sit through 4 minutes of credit roll to get to and at the end it is nothing but a rambling incoherent insignificant fluff piece whose only value is to show the Iron Man and Bruce Banner in the same scene with one joke about the Dr.Banner’s Temperament.